Thinking about participating in an endurance event but don’t know if you can or where to begin? Follow these 3 steps and I will see you at the finish line of the San Diego Marathon in June! Running Realtor Tested. Running Realtor Approved. Step 1: Get a Running Assessment. John Goldthorp is a Fitness Professional, Running Coach, and author of my favorite blog FixYourRun.com. John’s Running Assessment includes a Functional Movement Screening and a gait analysis. Even though I run like a Tyrannosaurus rex, John made me feel completely comfortable and more importantly confident that I can Fix My Run! Want to learn more about John? Subscribe to his blog, and hang with him Thursday nights at the Lululemon Run Club in Rittenhouse. Step 2: Get Fitted for the Right Pair of Shoes. Phil Clark is owner of The Training Station in Northern Liberties. Within these walls (and panoramic city views) is Run. Run is where Phil offers sneaker consultations by doing a gait analysis with a high definition camera (in your socks. So make sure they are clean and matching! ), measure your feet, and discuss your goals to find the perfect sneakers for you! On a budget? No worries! The fitting is free if you buy the kicks through Run! The Training Station is a full service gym, so if you’re looking for a new gym I suggest you check it out. Phil also offers tons of affordable services outside of a gym membership and one of my fav’s is the Whole Body Manual Stretch. I like to take advantage of the whole body manual stretch before an important race or before a long run. Step 3: Join Team In Training. Only Team In Training has trained over a half a million runners, walkers, triathletes, cyclists and hikers and raised over $1.2 billion to fund lifesaving research. Once you sign up, you’ll be training with our huge network of certified coaches who will have weekly group runs with you and your team. You’ll even have mentors for fundraising support as well as your own website for online fundraising. When I signed up for my first TNT event last year I had never run over 10 miles before. Cut to 4 months later I was crossing the finish line of the Paris Marathon. Most people who sign up for TNT have never even participated in an endurance event before. Participating in a TNT event has changed my life forever. It has made me realize that I am stronger than I ever thought I was. How TNT works is, you pick an event and they pay for you to get to the event (travel), stay at the event (hotel), and participate in the event, in exchange for a little fundraising for a fantastic cause (The Leukemia & Lymphoma Society). Easy right!? All there’s left to do is decide what event to participate in! Click here for Summer Events. Still not sure? This Saturday, (1/28) is our last pre-season training before the season starts in February. Come meet the team on Kelly Drive and while we run/walk for 50 minutes. We meet at the base of Kelly Drive, behind the Art Museum, under the gazebo at 8AM (rain or shine). You can meet the devoted mentors (including me) and the expert coaches! Don’t know what to wear? Rule of thumb: Dress as if it is 20 degrees warmer than it is. One you get moving and warmed up, you will thank me! I hope to see you there! Over the Fall Cee Heard and I (along w a few friends) ran a series of half-marathons. They were hard, but we had a blast! Join me at Philly Power Yoga! On the Go with Mo! This weekend I got a double dose of my TNT BFF Maureen Lafferty Colket! 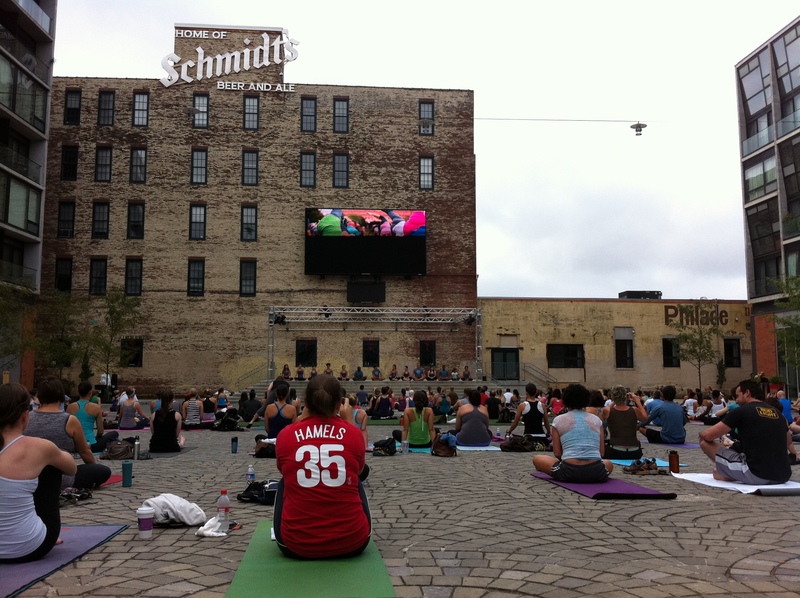 Saturday we participated in Lululemon’s Salutation Nation 9/10/11 at The Piazza in Northern Libertes. The weather was perfect and I really enjoyed doing yoga for the first time outside.